WDAFS 2018 attendees will have the option to take advantage of a variety of continuing education workshops, tours, and field trips including rafting, hiking, walking tours, and fishing! All Field trips take place May 25. Please see the ‘In & Around Anchorage’ tab for some additional commercial tour options, including a few with discounts! Contact Dan Rinella [email protected] for more information! Visit sites relevant to the restoration of habitat and streamflow in this Anchorage-area stream including an ongoing dam removal, upstream water diversions for municipal water and electrical generation, and the tailrace and associated hatchery salmon fishery. Participants will have lunch (provided) and a chance to hike along the shore of glacial Eklutna Lake in the Chugach Mountains. Spend a few hours fishing for native, wild Rainbow Trout, Dolly Varden, and Arctic Grayling in Willow Creek (and potentially other streams) in the Susitna Valley north of Anchorage. Transportation and lunch will be provided; all fishing gear, licenses, and knowledge of pertinent fishing regulations will be the responsibility of participants. Drive scenic Turnagain Arm with stops to look for Dall sheep, mountain goats, bears, waterfowl, and shorebirds. The Eulachon spawning run will be in full swing and may also bring opportunities to view the fishing behavior of beluga whales, harbor seals, bald eagles, and local humans. 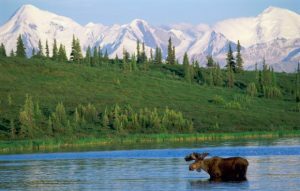 Will include a lunch stop in Girdwood (cost not included) and, depending on interest, stops for hiking, a ride up the Alyeska tram, a cruise to the Portage Glacier, or a tour of the Alaska Wildlife Conservation Center. Get a behind-the-scenes look at this high-tech recirculating facility run by the Alaska Department of Fish & Game to produce salmon, trout, and char for some of southcentral Alaska’s sport fisheries. The tour runs from 10 am to noon on Friday, May 25. Transportation will not be provided but the hatchery is 3.3 miles from the meeting venue along the Ship Creek bike path (rental bikes are available downtown near the meeting venue; allow at least an hour if walking and 20 minutes if biking). Participants should be aware that they cannot have been sport fishing on the 25th, or wear clothes they wore while sport fishing the day prior. A 5$ donation to the Student Travel Fund covers your attendance for this field trip! Travel to local water bodies with Patrick McCormick from Chugach View Outfitters to view the Alaska Blackfish (Dallia pectoralis: Esociformes: Esocidae), a Beringian endemic introduced to the Anchorage Bowl.